Y-27632 [(+)-(R)-trans-4-(1-aminoethyl)-N-(4-pyridyl)cyclohexanecarboxamide dihydrochloride] is widely used as a specific inhibitor of the Rho-associated coiled-coil forming protein serine/threonine kinase (ROCK) family of protein kinases. This study examined the inhibition mechanism and profile of actions of Y-27632 and a related compound, Y-30141 [(+)-(R)-trans- 4-(1-aminoethyl)-N-(1H-pyrrolo[2,3-b]pyridin-4-yl)cyclohexan-ecarboxamide dihydrochloride]. Y-27632 and Y-30141 inhibited the kinase activity of both ROCK-I and ROCK-II in vitro, and this inhibition was reversed by ATP in a competitive manner. This suggests that these compounds inhibit the kinases by binding to the catalytic site. Their affinities for ROCK kinases as determined by Ki values were at least 20 to 30 times higher than those for two other Rho effector kinases, citron kinase and protein kinase PKN. [3H]Y-30141 was taken up by cells in a temperature- and time-dependent and saturable manner, and this uptake was competed with unlabeled Y-27632. No concentrated accumulation was found, suggesting that the uptake is a carrier-mediated facilitated diffusion. Y-27632 abolished stress fibers in Swiss 3T3 cells at 10 μM, but the G1-S phase transition of the cell cycle and cytokinesis were little affected at this concentration. Y-30141 was 10 times more potent than Y-27632 in inhibiting the kinase activity and stress fiber formation, and it caused significant delay in the G1-S transition and inhibition of cytokinesis at 10 μM. The Ras-related small GTPase Rho functions as a molecular switch of various cellular processes by shuttling between the inactive, GDP-bound form and the active, GTP-bound form. Cellular actions of Rho have been studied by two ways. One is to express or microinject the active GTP-bound form of the protein in the cells and identify the phenotype of Rho activation. The other is to treat cells with botulinum C3 exoenzyme that specifically ADP-ribosylates and inactivates endogenous Rho and thereby identify the phenotype of Rho inactivation. Studies using either or both of these approaches have identified various cellular actions of Rho. They include regulation of stimulus-induced cell-to-substrate adhesion and motility, neurite retraction, cytokinesis, calcium sensitization of smooth muscle contraction, the G1-S progression of the cell cycle, cell transformation, and nuclear transcription by serum response factor [reviewed in Narumiya (1996)]. The cell-to-substrate adhesion is seen in cultured fibroblasts and epithelial cells as induction of actin stress fibers and focal adhesions. Thus, Rho has a variety of actions, each being critical in the respective process. It may be therapeutically useful if these Rho actions can be selectively manipulated by pharmacological means. Rho acts on downstream effectors to exert the above actions. Several proteins have been isolated as putative Rho effectors on the basis of their selective interaction with the GTP-bound form of Rho. These include the Rho-associated coiled-coil forming protein serine/threonine kinase (ROCK) family comprised of p160ROCK (ROCK-I) (Ishizaki et al., 1996) and ROKα/Rho-kinase/ROCK-II (Leung et al., 1995; Matsui et al., 1996; Nakagawa et al., 1996), protein kinase PKN (Amano et al., 1996;Watanabe et al., 1996), citron and citron kinase (Madaule et al., 1995,1998), and mammalian diaphanous homologs, mDia 1 and mDia 2 (Watanabe et al., 1997; Alberts et al., 1998). Among them, the ROCK family of kinases has been shown to be involved in Rho-induced formation of actin stress fibers and focal adhesions (Leung et al., 1996; Amano et al., 1997; Ishizaki et al., 1997) and in down-regulation of myosin phosphatase (Kimura et al., 1996). We recently reported a new synthetic compound named Y-27632 [(+)-(R)-trans-4-(1-aminoethyl)-N-(4-pyridyl)cyclohexanecarboxamide dihydrochloride] as a specific inhibitor of the ROCK family of kinases (Uehata et al., 1997). This compound inhibits agonist-induced contraction of vascular as well as bronchial smooth muscles through the inhibition of the calcium sensitization mechanism of smooth muscle contraction. The photoaffinity labeling using a125I-labeled analog of Y-27632 identified the target protein of this compound as ROCK-I, and the initial characterization revealed that Y-27632 inhibits the ROCK family of kinases 100 times more potently than other kinases including protein kinase C, cAMP-dependent kinase and myosin light chain kinase. Since this report, Y-27632 has been widely used as a ROCK inhibitor to identify and evaluate the involvement and roles of ROCK kinases in a variety of systems, including platelet activation (Klages et al., 1999), aortic smooth muscle contraction by various stimuli (Fu et al., 1998), thrombin-induced responses of aortic smooth muscle cells (Seasholtz et al., 1999), hypertrophy of cardiomyocytes (Kuwahara et al., 1999), bronchial smooth muscle contraction (Yoshii et al., 1999), activation of volume-regulated anion channels (Nilius et al., 1999), neurite retraction (Hirose et al., 1998), neutrophil chemotaxis (Niggli, 1999), wound healing (Nobes and Hall, 1999), tumor invasion (Itoh et al., 1999), and cell transformation (Sahai et al., 1999). However, the mechanisms of kinase inhibition and cell permeation of Y-27632 as well as the selectivity of Y-27632 among various Rho-mediated cellular actions have not yet been fully addressed. Information regarding these issues will be useful in interpreting the findings obtained by the use of this compound. In this study, using Y-27632 and a related compound, Y-30141 [(+)-(R)-trans-4-(1-aminoethyl)-N-(1H-pyrrolo[2,3-b]pyridin-4-yl)cyclohexanecarboxamide dihydrochloride], we have examined the kinetics of their kinase inhibition and cellular uptake, and compared their actions on three Rho-mediated cellular events, stress fiber formation, the G1-S phase progression of the cell cycle, and cytokinesis. Y-27632 and Y-30141, hereafter referred collectively as the “Y-compounds,” were synthesized as described in USP 4997834 and USP 5478838, respectively. They were dissolved in water and stored. These compounds are stable in an aqueous solution at room temperature for at least 4 weeks. Nocodazole and bromodeoxyuridine (BrdU) were purchased from Sigma (St. Louis, MO). Thymidine, anti-BrdU antibody, and human recombinant protein kinase C α (PKCα) were purchased from Kohjin Co. Ltd. (Tokyo, Japan), Becton Dickinson (San Jose, CA), and Calbiochem (San Diego, CA), respectively. [γ-32P]ATP (3000 Ci/mmol) was purchased from DuPont New England Nuclear (Boston, MA). [pyrro-4-3H]Y-30141 (17.1 Ci/mmol) was synthesized by Amersham Pharmacia Biotech by catalytic hydrogenation of the corresponding aryl bromide with tritium gas by the use of 10% paradium on carbon. It was delivered in 50% ethanol solution and stored at −20°C for 1 year before this experiment. Because it decomposed spontaneously during storage, we purified [3H]Y-30141 by a two-step extraction procedure before use. Briefly, the aqueous solution of [3H]Y-30141 was diluted with an equal volume of water, alkalized to pH 9.0 with ammonia water, and extracted with one volume of ethyl acetate. The ethyl acetate phase was saved and then extracted with one volume of diluted acetic acid at pH 4.0. [3H]Y-30141, first extracted into the organic phase, was extracted back to the aqueous solution by the second procedure. The purity of Y-30141 was examined by silica gel thin-layer chromatography using Kieselgel-60 (Merck, Darmstadt, Germany) with a solvent system of methanol/water/28% ammonia water (10:1:1). A single radioactive band comigrated with authentic Y-30141 at anRF value of 0.59. Recombinant ROCK-I, ROCK-II, PKN, or citron kinase was expressed in HeLa cells as Myc-tagged proteins by transfection using Lipofectamine, and was precipitated from the cell lysates by the use of 9E10 monoclonal anti-Myc antibody coupled to G protein-Sepharose (Ishizaki et al., 1997). Recovered immunocomplexes were incubated with various concentrations of [32P]ATP and 10 μg of histone type 2 as substrates in the absence or presence of various concentrations of either Y-27632 or Y-30141 at 30°C for 30 min in a total volume of 30 μl of the kinase buffer containing 50 mM HEPES-NaOH, pH 7.4, 10 mM MgCl2, 5 mM MnCl2, 0.02% Briji 35, and 2 mM dithiothreitol. PKCα was incubated with 5 μM [32P]ATP and 200 μg/ml histone type 2 as substrates in the absence or presence of various concentrations of either Y-27632 or Y-30141 at 30°C for 10 min in a kinase buffer containing 50 mM Tris-HCl, pH 7.5, 0.5 mM CaCl2, 5 mM magnesium acetate, 25 μg/ml phosphatidyl serine, 50 ng/ml 12-O-tetradecanoylphorbol-13-acetate and 0.001% leupeptin in a total volume of 30 μl. Incubation was terminated by the addition of 10 μl of 4× Laemmli sample buffer. After boiling for 5 min, the mixture was subjected to SDS-polyacrylamide gel electrophoresis on a 16% gel. The gel was stained with Coomassie Brilliant Blue, and then dried. The bands corresponding to histone type 2 were excised, and the radioactivity was measured.Ki values were either determined by the double reciprocal plot or calculated from an equation ofKi = IC50/(1 +S/Km), where S andKm are the concentration of ATP and theKm value for ATP, respectively. HeLa cells and Swiss 3T3 cells were plated on a 24-well dish at a density of 2 × 104 cells/well and cultured in Dulbecco's modified Eagle's medium (DMEM) containing 10% fetal bovine serum (FBS) for 1 day. Rat platelets were prepared from rat platelet-rich plasma, and suspended in DMEM. Rat lymphocytes were prepared from the spleen. After contaminated red blood cells were lysed by the treatment of Tris-NH4Cl buffer, they were suspended in DMEM. For the time course experiments, cells were incubated with 1 μM [3H]Y-30141 (0.4 μCi/well) at either 4°C or 37°C for indicated times in 0.5 ml of DMEM. For the saturation kinetics, Swiss 3T3 cells were incubated with various concentrations of [3H]Y-30141 (0.4 μCi/well) at 37°C for 10 min in 0.5 ml of DMEM. After incubation, the cells were washed twice with 1 ml of ice-cold phosphate-buffered saline (PBS) and lysed with 0.2 ml of 1 N NaOH. The radioactivity in the lysates was determined in an ACS-II liquid scintillator (Amersharm Pharmacia Biotech). To determine an intracellular Y-30141 concentration, Swiss 3T3 cells were incubated with 1 μM [3H]Y-30141 at 37°C for 30 min, and the cellular uptake by this culture was determined as described above. Cells in parallel cultures were dissociated by trypsin treatment, and the viable cell number was determined using the trypan blue dye exclusion method. For determination of a cell volume, 3 × 105viable cells were suspended in 1 ml and an aliquot of the suspension was aspirated into a micro-hematocrit capillary tube (Becton Dickinson). The tube was then centrifuged at 1000gfor 5 min, and a packed cell volume was determined. Effect of Y-Compounds on Cell Morphology. Swiss 3T3 cells were plated on a coverglass at a density of 2 × 104 cells per 3.5-cm dish and cultured in DMEM containing 10% FBS. After 1 day, various concentrations of Y-27632 or Y-30141 or vehicle were added to the culture and the cells were cultured for either 30 min or 24 h. Alternatively, after culture in serum-containing DMEM for 1 day, the cells were cultured in 2.7 ml of DMEM without serum for 24 h. Various concentrations of Y-27632 or Y-30141 were then added, and the cells were incubated for additional 30 min. Lysophosphatidic acid (LPA) was then added at 5 μM concentration, and the cells were incubated for indicated times in the continued presence or absence of the Y-compounds. Fixation, permeabilization, blocking, and immunofluorescence were performed as described previously (Ishizaki et al., 1997). For F-actin staining, Oregon green-conjugated phalloidin (Molecular Probes, Eugene, OR) was used. Cells were analyzed in 0.36-μm optical sections using a Bio-Rad MRC-1024 confocal imaging system, and built-up images were constructed. Effect of Y-Compounds on G1-S Transition. Swiss 3T3 cells were plated on a coverglass at a density of 3 × 104 cells per 3.5-cm dish and cultured in DMEM containing 10% FBS. After 1 day, the medium was changed to serum-free DMEM and the cells were further cultured for 36 h. The medium was removed, and the cells were incubated in fresh DMEM containing 10% FBS and 10 μM BrdU in the presence or absence of various concentrations of Y-27632 or 10 μM Y-30141 for indicated times at 37°C in a CO2 incubator. The cells were then fixed with 4% formaldehyde in PBS, without CaCl2 and MgCl2, and stained for BrdU incorporated in the cell nucleus as described previously (Olson et al., 1995). The number of BrdU-incorporated cells was counted in 300 cells per sample. Effect of Y-Compounds on Cytokinesis. HeLa cells were plated at a density of 3 × 104 cells per 3.5-cm dish. The cells were cultured in DMEM containing 10% FBS in the presence of 10 mM thymidine for 16 h. After the cells were washed with DMEM containing 10% FBS, they were cultured for an additional 8 h, and then 40 ng/ml of nocodazole was added. After 11.5 h of the nocodazole treatment, various concentrations of Y-27632, Y-30141, or vehicle was added and the cells were incubated for another 30 min. The mitotic round cells were then collected by repeated pipeting, washed three times with DMEM containing 10% FBS with or without the Y-compounds, and replated onto a coverglass. The cells were cultured for 4 h in DMEM containing 10% FBS in the continued absence or presence of the Y-compounds and then fixed. Cell nuclei were stained with 4,6-diamidino-2-phenylindole as described previously (Madaule et al., 1998). The number of multinucleated cells were counted in at least 100 cells. Inhibition of ROCK Kinases by Y-Compounds. Myc-tagged ROCK-I precipitated from lysates of HeLa cells overexpressing this kinase was incubated with 330 μg of protein/ml of histone type 2 and 1 μM ATP at 30°C. Recombinant ROCK-I phosphorylated histone as previously reported (Ishizaki et al., 1996); under the standard assay conditions, the phosphorylation proceeded linearly for 45 min and occurred in a manner dependent on the amount of the enzyme in the reaction (Fig.1A). Recombinant ROCK-I was then incubated with various concentrations of ATP at 37°C for 30 min, and the enzyme kinetics was analyzed. This analysis revealed the Michaelis-Menten kinetics for this reaction, and theKm value for ATP was calculated to be 0.15 μM by the double reciprocal plot of the reaction (Fig. 1B). To elucidate the inhibition mechanism of Y-27632, the reaction was further performed in the presence of 0.3 and 1 μM Y-27632. As shown in Fig.1B, the addition of Y-27632 increased the apparentKm values for ATP of ROCK-I in a concentration-dependent manner without any change in theVmax value. These findings suggest that Y-27632 inhibited ROCK-I by competing with ATP for its binding to the kinase. Similar results were obtained with ROCK-II (data not shown), and the Ki values of Y-27632 were estimated to be 0.22 and 0.30 μM for ROCK-I and ROCK-II, respectively (Table1). A related compound, Y-30141, acts similarly on ROCK kinases (Fig. 1C) with about 10 times higher affinities, the Ki values being 0.03 μM for ROCK-I and 0.05 μM for ROCK-II (Table 1). Selectivity of inhibition by Y-compounds was then examined by comparing theirKi values for two other Rho effector kinases, citron kinase and PKN, as well as PKCα. TheKi values of the Y-compounds for citron kinase and PKN were at least 20 times higher, and theKi values for PKCα were about 200 times higher than those for ROCK kinases (Table 1). A, time course of histone phosphorylation by ROCK. Reaction was carried out with 2- (♦), 1- (●), and 0.5- (○) times the standard amount of recombinant ROCK-I for indicated times as described under Materials and Methods. B and C, kinetic analysis of histone phosphorylation by ROCK-I and its inhibition by Y-27632 (B) and Y-30141 (C). Reaction was carried out with the standard amount of recombinant ROCK-I and various concentrations of ATP in the presence of 0 (○), 0.3 μM (●), or 1 μM (▪) Y-27632 or 0 (○), 0.03 μM (●), or 0.1 μM (▪) Y-30141, and the double reciprocal plots were constructed. Structures of the Y-compounds are shown in B and C. Typical results of four to five experiments are shown. Y-compounds, added at micromolar concentrations outside tissues and cells, could potently inhibit various ROCK-mediated processes, including agonist-induced smooth muscle contraction [see for example, Uehata et al. (1997) and Hirose et al. (1998)]. To elucidate the cell permeation mechanism of these compounds, we incubated cells with [3H]Y-30141 and examined the incorporation of the radioactivity into the cells. As shown in Fig. 2A, [3H]Y-30141 was incorporated by Swiss 3T3 cells in a time-dependent manner. This incorporated radioactivity reached a plateau by 30 min of incubation and was not reduced by the addition of an excess amount of cold Y-30141 at the plateau phase, indicating that the cell-associated radioactivity represented the uptake into the cells and not the binding to the cell surface. This uptake occurred in a temperature-dependent manner; only negligible uptake was found at 4°C. A similar extent of uptake occurred when Swiss 3T3 cells were incubated with [3H]Y-30141 in either DMEM or PBS alone or DMEM containing 10% FBS. Similar time- and temperature-dependent uptake was observed in rat blood platelets, rat lymphocytes, and HeLa cells (data not shown). To characterize this uptake mechanism, we next incubated Swiss 3T3 cells with various concentrations of [3H]Y-30141 and examined the saturation kinetics. As shown in Fig. 2B, the uptake increased hyperbolically with increasing concentrations of Y-30141, and theKm value of Y-30141 was estimated to be 3 mM from the analysis using a double reciprocal plot. The addition of Y-27632 reduced the [3H]Y-30141 incorporation in a concentration-dependent manner; at 10 mM about 50% reduction was observed (Fig. 2C). A similar concentration-dependent inhibition curve was obtained with cold Y-30141 (data not shown), indicating that Y-30141 and Y-27632 have similar affinities for the uptake. To see if this uptake can concentrate the Y-compounds in the cells, we determined the intracellular concentration of [3H]Y-30141 from the incorporated radioactivity and the packed cell volume. The intracellular concentration of Y-30141 was estimated to be 1 to 2 μM, when the cells were incubated with 1 μM Y-30141 for 30 min. Cellular uptake of Y-30141. A, time course of uptake. Swiss 3T3 cells were incubated with 1 μM [3H]Y-30141 (0.4 μCi/well) for indicated times at either 37°C (▪) or 4°C (♦), and the incorporated radioactivity was determined. B, kinetic analysis of uptake. Swiss 3T3 cells were incubated with various concentrations of [3H]Y-30141 (0.4 μCi/well) in 0.5 ml of DMEM for 10 min at 37°C, and the incorporated radioactivity was determined. Inset, the double reciprocal plot of the uptake. C, concentration-dependent inhibition of [3H]Y-30141 uptake by Y-27632. Values represent means ± S.E. of three experiments. Effects of Y-Compounds on Cell Morphology of Swiss 3T3 Cells. We previously showed that Y-27632 abolished stress fibers induced in HeLa cells by expression of an active Rho mutant, Val14-Rho, but not membrane ruffles induced by an active Rac mutant, Val12-Rac (Uehata et al., 1997). We now examined the effects of Y-compounds on LPA-induced stress fibers in Swiss 3T3 cells. Swiss 3T3 cells were cultured in serum-free medium and stimulated with LPA in the absence or presence of various concentrations of Y-27632 or Y-30141. The cells were then stained for actin. Swiss 3T3 cells became thin in serum-free medium, and showed disorganized F-actin structures in the cells. On stimulation with LPA, they resumed extended cell shape and induced actin stress fibers. 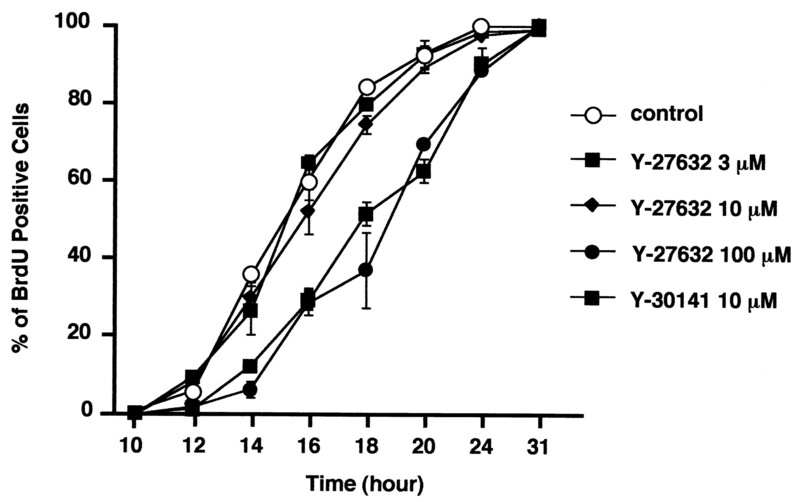 Prior treatment of cells with Y-compounds for 30 min prevented these changes in a concentration-dependent manner; almost complete inhibition was observed at 10 μM Y-27632 and 1 μM Y-30141 (Fig.3, A–F). We next added these compounds to Swiss 3T3 cells cultured in serum-containing medium, and asked whether the Y-compounds caused morphological changes. Two types of changes were produced by the addition of these compounds; one was the dissolution of actin stress fibers, and the other was the induction of thin processes extending over the original size of the cells. The former phenotype was seen within 30 min after the addition of both Y-compounds (Fig. 4, C and E). The latter became striking on longer incubation with Y-27632 (Fig. 4D), whereas the cells treated with 1 μM Y-30141 showed long spikes already on 30-min incubation (Fig. 4E). These changes were produced in a concentration-dependent manner; stress fibers almost disappeared in 30 min on incubation with 10 μM Y-27632 and with 1 μM Y-30141. This ratio of the potencies of the Y-compounds is identical with that of their inhibitory activities for ROCK kinases in vitro. 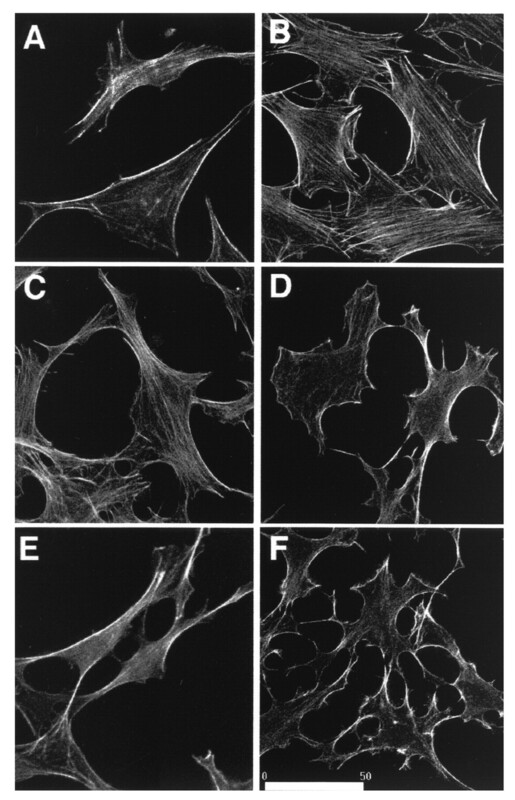 After 24 h of treatment, thin F-actin bundles reappeared in the treated cells, but the effects on the cell shape continued to be observed (Fig. 4, D and F). The resumed F-actin bundles were abolished by treating the cells with freshly prepared Y-compounds (data not shown). Effects of the Y-compounds on LPA-induced actin stress fibers. Swiss 3T3 cells were cultured in serum-free medium for 24 h. Before LPA stimulation, the cells were incubated with either 1 (C) or 10 (D) μM Y-27632 or 1 (E) or 10 (F) μM Y-30141. These cells were stimulated with either vehicle (A) or 5 μM LPA (B, C, D, E, and F) for 30 min at 37°C. The cells were then stained with Oregon green phalloidin. Bar, 50 μm. Effects of the Y-compounds on cell shape and actin stress fibers. Swiss 3T3 cells maintained in DMEM containing 10% FBS were incubated with either vehicle (A and B), 10 μM Y-27362 (C and D), or 10 μM 30141(E and F) for 30 min (A, C, and E) or 24 h (B, D, and F) in a CO2 incubator. The cells were then stained for actin. Bar, 50 μm. Effects of Y-Compounds on the Cell Cycle Progression from the G1-S Phase of Swiss 3T3 Cells. The involvement of Rho in the G1-S phase progression of the cell cycle has been well documented (Yamamoto et al., 1993; Olson et al., 1995;Hirai et al., 1997; Olson et al.,1998). However, the downstream member of Rho effectors mediating this process remains unknown. Using the Y-compounds, we examined whether ROCK is involved in the G1-S progression. Swiss 3T3 cells were enriched in the G1 phase of the cell cycle by serum starvation. The cells were then cultured in DMEM containing 10% FBS and BrdU. 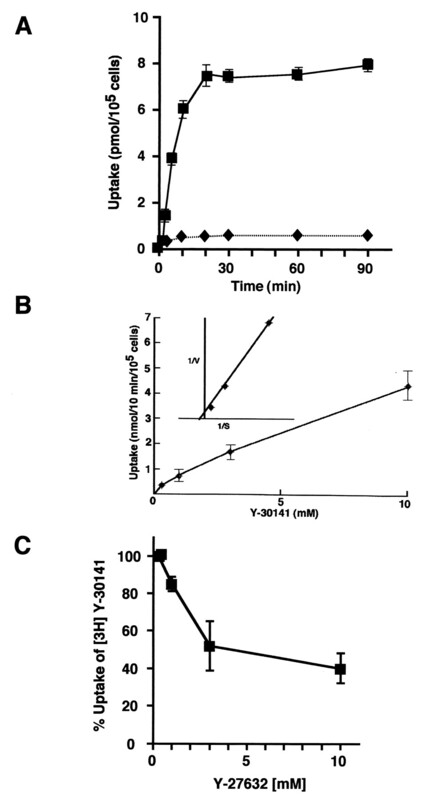 In control culture without the Y-compounds, BrdU-positive cells were detected at 12 h after serum addition, increased time-dependently, and almost all cells were labeled by 24 h. Y-27632 prolonged the lag time and delayed the appearance of BrdU-labeled cells in a concentration-dependent manner, delays of about 1 and 4 h were noticed in the cells treated with 10 and 100 μM Y-27632, respectively (Fig. 5). However, all the cells were eventually labeled with BrdU by 31 h after serum addition. Y-30141 was 10 times more potent in this action, causing a delay at 10 μM that was comparable with that found at 100 μM Y-27632. All the cells again progressed into the S phase by 31 h (Fig. 5). The potency ratio was identical with that of their ROCK inhibitory activities, although higher concentrations were required to exert this action than those required for inhibition of stress fiber induction as above, smooth muscle contraction (Uehata et al., 1997), and neurite retraction (Hirose et al., 1998). Effects of the Y-compounds on G1-S progression in Swiss 3T3 cells. The cells were cultured for 36 h in serum-free medium, and then cultured in the medium containing 10% FBS. Ten μM BrdU and various concentrations of either Y-27632 or 10 μM Y-30141 were also added. The cells were fixed at indicated times and stained with anti-BrdU antibody. The numbers of BrdU-positive cells were counted under fluorescence microscopy of 300 cells. The results of three independent experiments are shown. Effects of Y-Compounds on Cytokinesis of M Phase-Enriched HeLa Cells. Experiments using C3 exoenzyme and/or Rho GDP-dissociation inhibitor revealed that Rho critically regulates cytokinesis by inducing and maintaining the contractile ring (Kishi et al., 1993;Mabuchi et al., 1993; Drechsel et al., 1997). Involvement of Rho effectors such as mDia (Watanabe et al., 1997), citron kinase (Madaule et al., 1998) and Rho-kinase (Yasui et al., 1998) in this process have been suggested. Using a specific antibody to ROCK-I (Ishizaki et al., 1996), we first determined the localization of endogenous ROCK during cytokinesis in HeLa cells by immunofluorescence analysis. As shown in Fig. 6, ROCK-I immunoreactivity was distributed homogeneously in the cytoplasm through G1 to metaphase, but a part of the molecules appeared to be concentrated in the cleavage furrow in telophase, suggesting that ROCK is involved in cytokinesis. We then evaluated the involvement of ROCK in this process by using the Y-compounds. HeLa cells were subjected to thymidine block followed by nocodazole treatment. By this procedure about 60% of the cells were enriched in the M phase. When these cells were released by washing free of nocodazole, about 80% of the M phase-enriched cells underwent cytokinesis that completed in 4 h after the release. Y-27632 added 30 min before the release inhibited cytokinesis in a concentration-dependent manner. However, inhibition was first detected at 30 μM Y-27632 and became significant only at 100 μM (Fig.7). Y-30141 showed higher inhibitory potency; inhibition appeared at 3 μM and became significant at 30 μM. Effects of the Y-compounds on cytokinesis in HeLa cells. The cells were incubated with nocodazole for 11.5 h and then treated with various concentration of Y-27632 (■) or Y-30141 (▪) for 30 min. The cells were washed free of nocodazole, resuspended in DMEM containing 10% FBS and the Y-compounds, and cultured for 4 h. The number of cells showing cytokinesis failure was counted in 200 cells. The results of three independent experiments are shown as mean ± S.E. Statistical significance of differences between the control and each treated group was determined by the Dunnett's multiple comparison test. A difference was considered to be statistically significant when the P value was less than .01 (*P < .01). In this study we have characterized the mechanisms of the kinase inhibition of Y-27632 and a related compound Y-30141. We found that these compounds inhibit ROCK kinases by competing with ATP for binding to the kinases. This finding led us to speculate that the selectivity of these compounds as kinase inhibitors is derived from a difference in their Ki values to various kinases. Indeed, experiments using different types of kinases in this study as well as in our previous study (Uehata et al., 1997) showed that both Y-compounds showed much lower Ki values to the ROCK family of kinases than to other kinases, including citron kinase, PKN, PKC, cAMP-dependent protein kinase, and myosin light chain kinase. We next investigated the cell permeation mechanism of these compounds, and found that they are taken up by cells by a carrier-mediated facilitated diffusion without concentration in the cell. This finding suggests that the extracellular concentration of the Y-compounds added outside tissues and cells are almost equivalent to their intracellular concentration to exert inhibition of biological responses in the cell. The concentration-inhibition relationship of Y-27632 was examined in several systems, including inhibition of phenylephrine-induced contraction of rabbit aorta (Uehata et al., 1997), inhibition of LPA-induced neurite retraction of N1E-115 cells (Hirose et al., 1998), inhibition of myosin light chain phosphorylation in neutrophils (Niggli, 1999), inhibition of bronchial smooth muscle contraction (Yoshii et al., 1999), and inhibition of agonist-induced secretory response in platelets (Suzuki et al., 1999). In all cases, the inhibition was detected at 10−7 M and almost complete at 10−5 M. This is almost identical to the concentration-inhibition relationship of Y-27632 for inhibition of stress fibers in Swiss 3T3 cells in this study. These results suggest that Y-27632 can exert specific effects at lower μM concentrations in the cells. This appears contradictory to the property of Y-27632 as a competitive inhibitor for ATP described above, because it is generally accepted that ATP is present at millimolar concentrations in the cell [see for example, Stryer (1995) and Traut (1994)]. 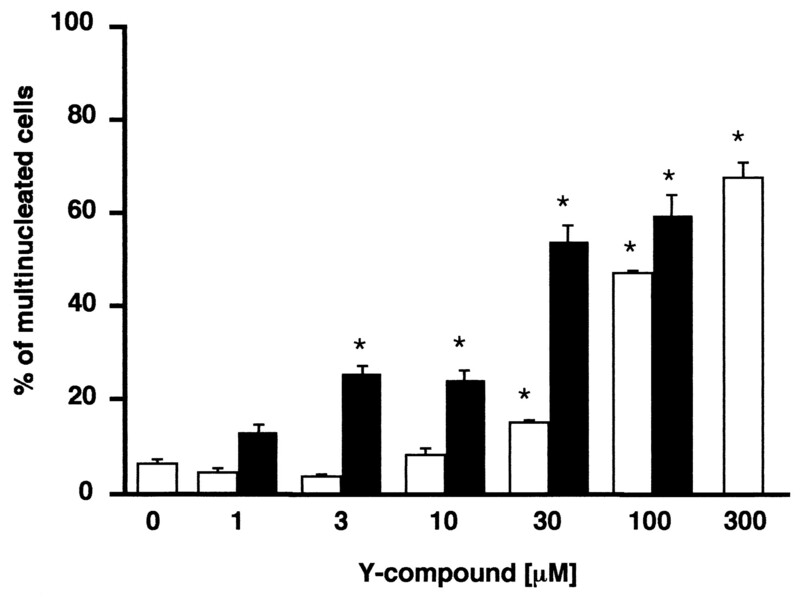 In that case, the competitive inhibition kinetics suggests that millimolar concentrations of the Y-compounds are required to inhibit the kinase activity of ROCK in situ in the cell. It is also difficult to imagine that the Y-compounds exert specific inhibition of ROCK kinases under these conditions, where the IC50 value and notKi determines the specificity, raising a possibility that Y-27632 acts on another target to exert cellular effects. However, accumulating evidence strongly suggests that ROCK kinases are indeed the target of Y-27632 and related compounds. First, the photoaffinity labeling using a photoactivable derivative of Y-27632 detected ROCK kinases as an exclusive cellular binding protein with a specificity to various compounds identical with that of cellular effects of these compounds (Uehata et al., 1997). Second, as shown in this study as well as by other studies described above, the Y-compounds exert specific inhibition of cellular processes such as stress fiber induction and neurite retraction, in which the involvement of ROCK kinases has been verified independently by the use of a dominant negative form of ROCK (Ishizaki et al., 1997; Hirose et al., 1998). Third and most intriguingly, Y-27632 added at μM concentrations to permeabilized smooth muscle preparations together with millimolar concentrations of ATP induced specific inhibition of smooth muscle contraction through the Ca2+ sensitization mechanism, which is mediated by ROCK kinases (Uehata et al., 1997, Fu et al., 1998; Yoshii et al., 1999). These results suggest that, although the Y-compounds inhibit purified ROCK kinases in vitro in a cell free system by competing with ATP, an additional mechanism operates in the cell for Y-compounds to elicit specific inhibition of the kinases in situ. Recently, a variety of kinase inhibitors directed to the ATP-binding site have been developed (Toledo et al., 1999). These compounds exert specificity of their action by binding to the ATP-binding sites and occupying spaces that are diverse among various kinases. X-ray crystallography of the enzyme-inhibitor complex in some studies revealed that inhibitors such as SU-5402 and PD 173074, both directed to the fibroblast growth factor receptor kinase, induced additional conformational change of the enzyme specific to each inhibitor (Mohammadi et al., 1997; Mohammadi et al., 1998). These compounds show competition with ATP in an in vitro phosphorylation reaction using purified kinase, but nonetheless exert selective and potent inhibition of the target kinase expressed in the cells with almost identical IC50 concentrations as theirKi values, as seen for Y-27632 [see for example, Hirose et al. (1998)]. These findings suggest that binding of these inhibitors and subsequent conformational change of the target kinase not only competes for ATP binding but also causes additional inhibitory effects on the enzyme catalysis, possibly by interfering with binding of specific protein substrates. Whether Y-27632 also induces specific conformational change in ROCK kinases awaits results of additional crystallization studies of the ROCK kinase in complex with the Y-compounds. This study also compared the inhibitory effects of the Y-compounds on three Rho-mediated processes, namely, the stress fiber induction, the G1-S progression, and cytokinesis. Y-27632 inhibited the LPA-induced stress fiber formation at 10 μM, and Y-30141 was about 10 times more potent than Y-27632 in this action. These results are consistent with their potencies in inhibition of smooth muscle contraction and of neurite retraction, the involvement of ROCK kinases in both of which processes have been well established. The involvement of ROCK kinases in the formation of stress fibers have been established by the use of dominant negative mutants of these kinases (Ishizaki et al., 1997). Prolonged incubation with Y-27632 induced long neurite-like processes in Swiss 3T3 cells in a similar concentration-dependent manner. Our previous study showed that these processes were made mainly of microtubules and intermediate filaments, the growth of which was stimulated presumably by the loss of tension of the ROCK-mediated contractile actomyosin filaments (Hirose et al., 1998). Whether ROCK has a direct action on the assembly and disassembly of microtubules remains unknown. During this study we noted that actin bundles reappeared in 24 h in the treatment with Y-27632 and that these bundles were again abolished by the addition of freshly prepared Y-27632 solution. We also found that the Y-27632-containing medium recovered from 24-h culture with cells showed the decreased activity to inhibit stress fibers, whereas Y-27632 incubated with the culture medium alone retained the original potency (data not shown). These results indicated that Y-27632 was somehow inactivated during incubation with cultured cells. In this study we found that the Y-compounds did not block but delayed the G1-S progression. Consistent with inhibition of other ROCK actions, Y-30141 was ten times more active than Y-27632. However, much higher concentrations of both compounds were required for this action; significant delay was observed only at 100 μM Y-27632. The treated cells also eventually moved to the S phase. This is in contrast to the action of C3 exoenzyme on the same line of cells that suppresses the G1-S transition completely (Yamamoto et al., 1993; Olson et al., 1995). These results suggest that ROCK may not be a critical component in the regulation of the G1-S progression by Rho in this line of cells. This study, however, does not exclude that ROCK works critically in the G1-S transition in some other lines of cells. Y-27632 significantly inhibited the thrombin-induced DNA synthesis in cultured aortic smooth muscle cells at 10 μM (Seasholtz et al., 1999). Finally, we used the Y-compounds and examined the role of ROCK kinases in cytokinesis. We found that the actions of the Y-compounds on cytokinesis were different from those on stress fiber induction and that, like the delay in the G1-S transition, much higher concentrations were required; more than 100 μM concentrations of Y-27632 is required for significant inhibition, which exerted damaging effects on these cells. On the other hand, the present immunocytochemical study as well as the previous report (Yasui et al., 1998) revealed the enrichment of ROCK in the cleavage furrow, suggesting its involvement in cytokinesis. These results suggest the presence of a redundant or compensatory mechanism that can complement the inhibition of ROCK kinases. We have reported that another Rho effector, citron kinase, which shares about 40% amino acid sequence identity in the kinase domain to ROCK kinases, also accumulates in the cleavage furrow during cytokinesis. As shown in this study, citron kinase is about 10 times more resistant to the Y-compounds (Table 1). We thank T. Murozono for measuring the Y-27632 concentration, H. Bito, N. Watanabe, A. Fujita, and T. Murata for valuable discussions and advice, and T. Arai and H. Nose for secretarial assistance. This work was supported in part by Grants-in-Aid for Specially Promoted Research (08102007) and for Scientific Research (C)(2) (10670120) from the Ministry of Education, Science, and Culture of Japan, and grants from Searle Fellowship, the Japan Foundation for Applied Enzymology, the Tanabe Medical Frontier Conference, and the Human Frontier Science Program. (1998) Analysis of RhoA-binding proteins reveals an interaction domain conserved in heterotrimeric G protein β subunits and the yeast response regulator protein Skn7. J Biol Chem 273:8616–8622. 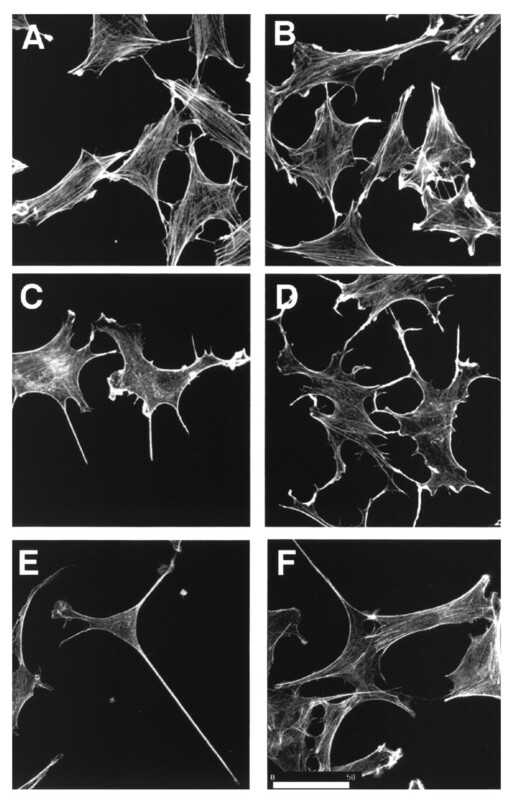 (1997) Formation of actin stress fibers and focal adhesions enhanced by Rho-kinase. Science 275:1308–1311. (1996) Identification of a putative target for Rho as the serine-threonine kinase protein kinase N. Science 271:648–650. (1997) A requirement for Rho and Cdc42 during cytokinesis in Xenopus embryos. Curr Biol 7:12–23. 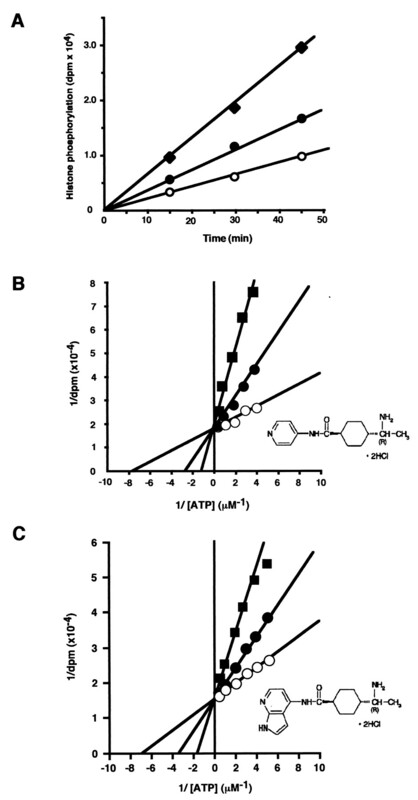 (1998) The effects of the Rho-kinase on arachidonic acid-, GTPγS-, and phorbol ester-induced Ca2+-sensitization of smooth muscle. FEBS Lett 440:183–187. (1997) Geranylgeranylated rho small GTPase(s) are essential for the degradation of p27Kip1 and facilitate the progression from G1 to S phase in growth-stimulated rat FRTL-5 cells. J Biol Chem 272:13–16. (1998) Molecular dissection of the Rho-associated protein kinase (p160ROCK)-regulated neurite remodeling in neuroblastoma N1E-115 cells. J Cell Biol 141:1625–1636. (1996) The small GTP-binding protein Rho binds to and activates a 160 kDa Ser/Thr protein kinase homologous to myotonic dystrophy kinase. EMBO J 15:1885–1893. (1997) p160ROCK, a Rho-associated coiled-coil forming protein kinase, works downstream of Rho and induces focal adhesions. FEBS Lett 404:118–124. (1999) An essential part for Rho-associated kinase in the transcellular invasion of tumor cells. Nat Med 5:221–225. (1996) Regulation of myosin phosphatase by Rho and Rho-associated kinase (Rho-kinase). Science 273:245–248. (1993) Regulation of cytoplasmic division of Xenopus embryo by rho p21 and its inhibitory GDP/GTP exchange protein (rho GDI). J Cell Biol 120:1187–1195. (1999) Activation of G12/G13 results in shape change and Rho/Rho-kinase-mediated myosin light chain phosphorylation in mouse platelets. J Cell Biol 144:745–754. (1999) The effects of the selective ROCK inhibitor, Y27632, on ET-1-induced hypertrophic response in neonatal rat cardiac myocytes: Possible involvement of Rho/ROCK pathway in cardiac muscle cell hypertrophy. FEBS Lett 452:314–318. (1996) The p160 RhoA-binding kinase ROK alpha is a member of a kinase family and is involved in the reorganization of the cytoskeleton. Mol Cell Biol 16:5313–5327. (1995) A novel serine/threonine kinase binding the Ras-related RhoA GTPase which translocates the kinase to peripheral membranes. J Biol Chem 270:29051–29054. (1993) A rho-like protein is involved in the organization of the contractile ring in dividing sand dollar eggs. Zygote 1:325–331. (1998) Role of citron kinase as a target of the small GTPase Rho in cytokinesis. Nature 394:491–494. (1995) A novel partner for the GTP-bound forms of rho and rac. FEBS Lett 377:243–248. (1996) Rho-associated kinase, a novel serine/threonine kinase, as a putative target for small GTP binding protein Rho. EMBO J 15:2208–2216. (1998) Crystal structure of an angiogenesis inhibitor bound to the FGF receptor tyrosine kinase domain. EMBO J 17:5896–5904. (1997) Structures of the tyrosine kinase domain of fibroblast growth factor receptor in complex with inhibitors. Science 276:955–960. (1996) ROCK-I and ROCK-II, two isoforms of Rho-associated coiled-coil forming protein serine/threonine kinase in mice. FEBS Lett 392:189–193. (1996) The small GTPase Rho: Cellular functions and signal transduction. J Biochem 120:215–228. (1999) Rho-kinase in human neutrophils: A role in signalling for myosin light chain phosphorylation and cell migration. FEBS Lett 445:69–72. (1999) Role of Rho and Rho kinase in the activation of voltage-regulated anion channels in bovine endothelial cells. J Physiol 516:67–74. (1999) Rho GTPases control polarity, protrusion, and adhesion during cell movement. J Cell Biol 144:1235–1244. (1995) An essential role for Rho, Rac, and Cdc42 GTPases in cell cycle progression through G1. Science 269:1270–1272. (1998) Signals from Ras and Rho GTPases interact to regulate expression of p21Waf1/Cip1. Nature 394:295–299. (1999) Transformation mediated by RhoA requires activity of ROCK kinases. Curr Biol 9:136–145. (1999) Rho and Rho kinase mediate thrombin-stimulated vascular smooth muscle cell DNA synthesis and migration. Cir Res 84:1186–1193. (1995) Biochemistry 4th ed. , New York, W. H. Freeman and Co..
(1999) Agonist-induced regulation of myosin phosphatase activity in human platelets through activation of Rho-kinase. Blood 93:3408–3417. (1994) Physiological concentrations of purines and pyrimidines. Mol Cell Biochem 140:1–22. (1999) The structure-based design of ATP-site directed protein kinase inhibitors. Curr Med Chem 6:775–805. (1997) Calcium sensitization of smooth muscle mediated by a Rho-associated protein kinase in hypertension. Nature 389:990–994. (1997) p140mDia, a mammalian homolog of Drosophila diaphanous, is a target protein for Rho small GTPase and is a ligand for profilin. EMBO J 16:3044–3056. (1996) Protein kinase N (PKN) and PKN-related protein rhophilin as targets of small GTPase Rho. Science 271:645–648. (1993) ADP-ribosylation of the rhoA gene product by botulinum C3 exoenzyme causes Swiss 3T3 cells to accumulate in the G1 phase of the cell cycle. Oncogene 8:1449–1455. (1998) Roles of Rho-associated kinase in cytokinesis; mutations in Rho-associated kinase phosphorylation sites impair cytokinetic segregation of glial filaments. J Cell Biol 143:1249–1258. (1999) Relaxation of contracted rabbit tracheal and human bronchial smooth muscle by Y-27632 through inhibition of Ca2+ sensitization. Am J Respir Cell Mol Biol 20:1190–1200.